The Assignment: Use an image not as a graphic score, but as a graphic depiction of a remix. 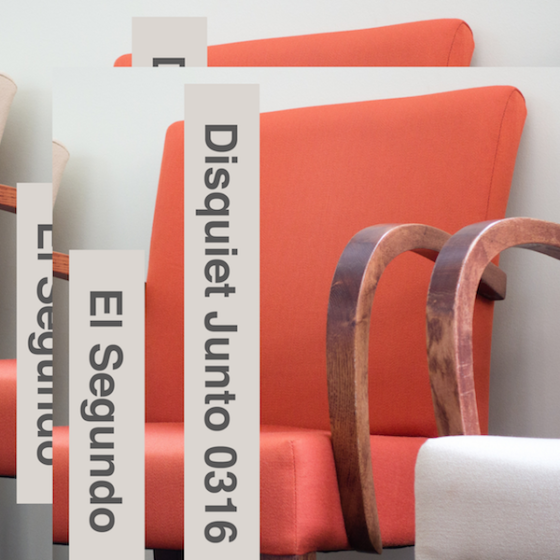 Each Thursday in the Disquiet Junto group, a new compositional challenge is set before the group’s members, who then have just over four days to upload a track in response to the assignment. Membership in the Junto is open: just join and participate. (A SoundCloud account is helpful but not required.) There’s no pressure to do every project. It’s weekly so that you know it’s there, every Thursday through Monday, when you have the time. Deadline: This project’s deadline is Monday, November 19, 2018, at 11:59pm (that is, just before midnight) wherever you are on. It was posted in the afternoon, California time, on Thursday, November 15, 2018. Tracks will be added to the playlist for the duration of the project. Step 1: We’ve done lots of “graphic notation” projects in the Disquiet Junto over the years, projects in which an image is interpreted as if it had been intended as a musical score. This week we’re using an image to suggest a means of remixing/reworking a pre-existing piece of music. Step 2: Look at the image associated with this project. It shows the top of a clock visible beneath a dense scrim of colorful striations. Compare this image to the original image, which accompanied Disquiet Junto project 0357, from two weeks ago. That image is available at disquiet.com/0357. Think about how this week’s image can be interpreted as aesthetic instructions for a remix. It might be informative to know that the 0359 image resulted from a glitch that occurred when I was rendering the “cover” image for project 0357. Step 4: Choose a track from Step 3. If the track isn’t available (i.e., downloadable and posted with a license allowing for creative reuse), either choose another track or contact the original musician to ask for permission. Step 5: Remix/rework the track you selected in Step 4 by applying the aesthetic approach you thought about in Step 2. 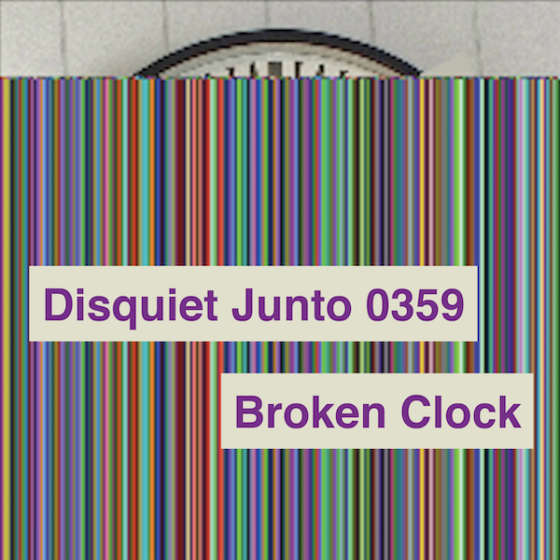 Step 1: Include “disquiet0359” (no spaces or quotation marks) in the name of your track. Step 2: If your audio-hosting platform allows for tags, be sure to also include the project tag “disquiet0359” (no spaces or quotation marks). If you’re posting on SoundCloud in particular, this is essential to subsequent location of tracks for the creation a project playlist. Title/Tag: When posting your track, please include “disquiet0359” in the title of the track, and where applicable (on SoundCloud, for example) as a tag. Download: Please consider setting your track as downloadable and allowing for attributed remixing (i.e., a Creative Commons license permitting non-commercial sharing with attribution, allowing for derivatives). The Assignment: Update a track by one Junto participant by adding beats from another Junto participant's imaginary drum machine. Deadline: This project’s deadline is Monday, August 27, 2018, at 11:59pm (that is, just before midnight) wherever you are on. It was posted in the afternoon, California time, on Thursday, August 23, 2018. Tracks are added to the playlist for the duration of the project. The Assignment: Update a track by one Junto participant by adding beats from another Junto participant’s imaginary drum machine. Major thanks to Matt Nish-Lapidus and Jason Wehmhoener for having helped put together this project. Step 1: Two weeks ago in the Disquiet Junto, people made beats for their own imaginary drum machines. Last week in the Junto, people used other people’s beats from the prior project to make their own tracks. This week, the third week of this multi-part project, you’ll remix a track from the second week using beats from the first week. Step 4: Having chosen tracks in Steps 2 and 3 above, confirm the tracks are downloadable. If one isn’t, either get in touch with the musician who made it, or choose another track. Step 5: Remix/rework/remodel the track you selected in Step 2 with beats you selected in Step 3. 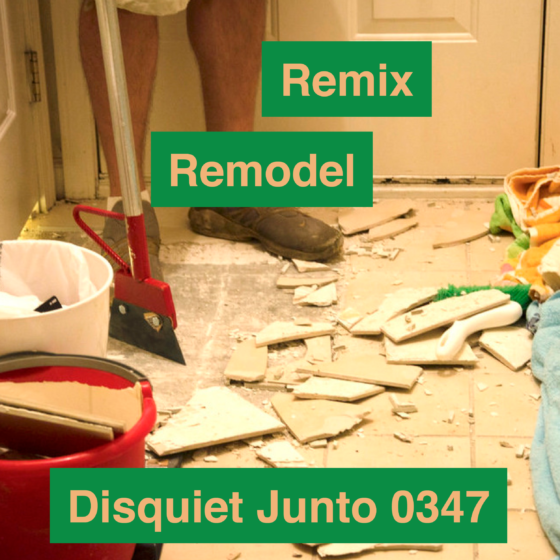 Step 1: Include “disquiet0347” (no spaces or quotation marks) in the name of your track. Step 2: If your audio-hosting platform allows for tags, be sure to also include the project tag “disquiet0347” (no spaces or quotation marks). If you’re posting on SoundCloud in particular, this is essential to subsequent location of tracks for the creation a project playlist. Title/Tag: When posting your track, please include “disquiet0347” in the title of the track, and where applicable (on SoundCloud, for example) as a tag. Major thanks to Matt Nish-Lapidus and Jason Wehmhoener for having helped put together this and the preceding two projects. I listen to a lot of music by musicians about whom I know very little. This contextual void is the nature of the internet, a medium that aspires to a state of frictionless-ness. The circumstance is exacerbated by my listening habits, which tend toward digital crate-digging, a longstanding inclination toward hypertextual windings through Bandcamp, SoundCloud, YouTube, message boards, and other places where musicians post their work, often under pseudonyms, often without any information at all about who they are, where they live, what they are up to in life, or what constitutes the music they have posted. Add to it foreign-to-me languages, no matter a bookmarked Google Translate at the ready, and even the more loquacious sources of music can remain opaque. And of all the near-anonymous musicians I follow, few exceed for me the intrigue/knowledge ratio of the Japan-based individual (it appears to be an individual, but may be more than one person) who goes by the name Corruption — drop the “u” to access via SoundCloud at soundcloud.com/corrption. I’ve been listening to Corr(u)ption at least since the end of 2013, by which point the account had accumulated several dozen tracks, ranging from avant-garde hip-hop to urban field recordings. As of today, that count is well past 500. There are, still, ways that information accumulates, even against such a musician’s perceived intentions. For one thing, there is rewinding the path that led you to a particular music recording. (In the case of Corruption, however, I can’t reconstruct what that path was.) For another, it is through association, such as, in Corruption’s case, the musicians who also record for the Damade record label. A new release on Damade, from the Japanese post-rock duo Kasetsu (in English: “Hypothesis”), includes remixes by other Damade roster members, among them Corruption. Even if we can’t get a bead on Corruption, we can triangulate certain musical motivations by listening to the before and after of Corruption’s remixes. There are two on the new Kasetsu album, which is titled simply /01, and a third and fourth on Corruption’s SoundCloud account. The original of Kasetsu’s “ONOMAT” is a tasty bit of instrumental post-rock, echoing Tortoise’s time-signature mirages and Shellac’s visceral tendencies. In Corruption’s hands, a hard, rubbery reverb is put on the track, so it reflects back on itself in quick, merciless bursts, exaggerating the original’s metric complexity into something nearly psychedelic. “Assob” adds a bit of lounge jazz to the mix, giving the track the feel of a forgotten Minutemen song — it moves back and forth between noticeably different segments, as much collage as verse-chorus-verse in structure. In this case, Corruption cuts the original by more than half, and forces it into a more martial cadence. Like the original, it speeds up as it goes, eventually becoming a pachinko parlor scored by Carl Stalling. In addition, there is “line” on /01, which sounds like the economical backing track to a new wave song. It’s not difficult to imagine Debora Iyall or Ric Ocasek’s voice suddenly appearing. In the soundcloud.com/corrption reworking, Corruption notices the slight reggae quality to the original (shades of early Police, perhaps — Stewart Copeland’s syncopations were certainly post-rock premonitions), and amplifies it into casual robotoic dub that becomes enamored of its own repetitions. There is also a reworking of the first track off /01, “Express,” which is the most violently transformed of the batch, a shuddering explosion of fragmented loops. Throughout the remixes, we get a fix on Corruption’s interest in dub and the varied potential impacts of repetition. Get the full album at damade.bandcamp.com. More from Corruption at soundcloud.com/corrption. The Assignment: Record the second third of a trio, adding to a pre-existing track. Deadline: This project’s deadline is 11:59pm (that is, just before midnight) wherever you are on Monday, January 22, 2018. This project was posted in the morning, California time, on Thursday, January 18, 2018. Step 1: This week’s Disquiet Junto project is the second in a sequence that explores and encourages asynchronous collaboration. This week you will be adding music to a pre-existing track, which you will source from the previous week’s Junto project (disquiet.com/0315). Note that you aren’t creating a duet — you’re creating the second third of what will eventually be a trio. Keep this in mind. Step 3: Record a short piece of music, roughly the length of the piece of music you selected in Step 2. Your track should complement the piece from Step 2, and leave room for an eventual third piece of music. When composing and recording your part, do not alter the original piece of music at all, except to pan the original fully to the left. In your finished audio track, your part should be panned fully to the right. To be clear: the track you upload won’t be your piece of music alone; it will be a combination of the track from Step 2 and yours. Step 4: Also be sure, when done, to make the finished track downloadable, because it will be used by someone else in a subsequent Junto project. Step 1: Include “disquiet0316” (no spaces or quotation marks) in the name of your track. Step 2: If your audio-hosting platform allows for tags, be sure to also include the project tag “disquiet0316” (no spaces or quotation marks). If you’re posting on SoundCloud in particular, this is essential to subsequent location of tracks for the creation a project playlist. Step 5: Annotate your track with a brief explanation of your approach and process. Be sure to name the track to which you’ve added music and the name of the musician who recorded it, and include a link to it. Title/Tag: When posting your track, please include “disquiet0316” in the title of the track, and where applicable (on SoundCloud, for example) as a tag. 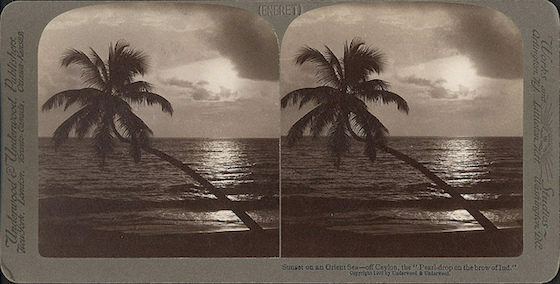 Explore chance by exploring the roots of the word "serendipity." Deadline: This project’s deadline is 11:59pm (that is, just before midnight) wherever you are on Monday, November 6, 2017. This project was posted in the early afternoon, California time, on Thursday, November 2, 2017. This week’s project explores the concept of serendipity. I was unfamiliar with the word’s etymology until I recently read the book Algorithms to Live By: The Computer Science of Human Decisions, by Brian Christian and Tom Griffiths, which I recommend. Those language origins figure into this project’s formulation. Step 1: The word “serendipity” has an interesting origin. Its coinage is credited to Horace Walpole, who apparently made it up based on a Persian fairy tale, “The Three Princes of Serendip.” In turn, “Serendip” is itself a Persian word for another place entirely, Sri Lanka, or Ceylon. To explore the nature of serendipity, we’re going to apply randomness to samples of Ceylonese music. There’s a lot of it, 138 tracks in all, so it might help to employ chance routines to select both the the tracks you’ll use, and which segments you’ll extract from them. Step 3: Extract a short piece of audio, between two and seven seconds, from each of the three tracks you selected in Step 2. Each extract should be of a different length from the other two. Again, you might do this by ear, or you might do it based on some sort of chance routine. Side note: There was a typo in the original instructions calling for a three-minute loop of the third sample. This was an error. It was intended to be a two-minute loop, like the others. Step 5: Layer the three loops from Step 4. Do so in a way that might allow you to subsequently manipulate the loops individually, should you choose to do so. Notably, the three tracks will be out of sync with each other. Step 6: Listen through to the layered piece in Step 5. Pay attention for moments of chance intersection, of rhythmic ingenuity, melodic unlikelihoods, and textural congruence, among other potential results. Step 7: Create a short piece of music, based on the observations you made in Step 6, that builds on those serendipitous results. This may be as simple as using relative volume to highlight the highlights, or you might add other musical elements. Step 1: If your hosting platform allows for tags, be sure to include the project tag “disquiet0305” (no spaces) in the name of your track. If you’re posting on SoundCloud in particular, this is essential to my locating the tracks and creating a playlist of them. Length: The finished track’s length is up to you. Title/Tag: When posting your track, please include “disquiet0305” in the title of the track, and where applicable (on SoundCloud, for example) as a tag.